For the last thirty years there has only been one name people thaink of when it comes to striptease dancing. The Chippendales have been strutting their stuff in front of fanatical women since they formed in 1979. 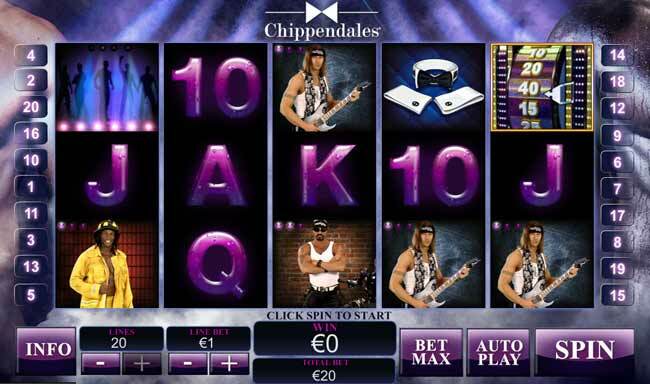 The game has 20 paylines and features some of the well known hunky guys as the symbols. Spin the reels and get a winning combination for a great cash payout. There are also some great bonus features and instant cash rewards available. The graphics are very good, just like feature movie intro to the game where you get to see all the guys in action. The collar and cuffs logo is a wild symbol and the boys dancing on stage is the scatter which can win you up to 100x your bet. Getting bonus symbols on reels 1, 3 and 5 will bring you to the sizzling spin where you will be faced with one of the lads to spin the reel. The reel will reward you with a multiplier of your total bet. One of the great features of this game that will excite the girls is the SYMBOL STRIP FEATURE. On the reels their are five hunky chippendale strippers. As you spin the reels you will reveal the characters and if the hunk forms part of a winning combination he will strip down to the next level. This is a fun new game with some interesting bonus features. The jackpot payouts are not the highest but the game does have a fun side and is definitely one for the ladies.